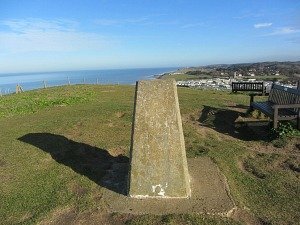 This Norfolk Coast Path Blog is all about how I walked this incredible path and how much I enjoyed it, what I noticed on the way, what I saw and how I felt. 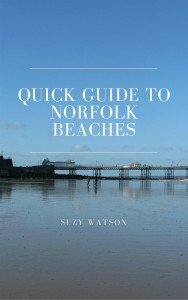 I really did love this walk and really hope you’ll choose to walk this National Trail and see for yourself the incredible scenery that Norfolk has to offer. 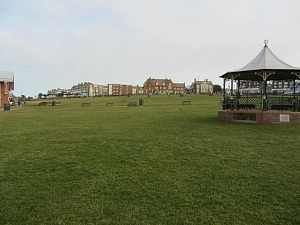 I started out on the Green at Hunstanton on a beautifully sunny but cold morning. The cliff path towards Old Hunstanton was full of distraction right from the start, with beautiful Norfolk terrier dogs (I am of course biased as I have Norwich Terriers), wonderful views out to sea and the iconic white lighthouse at Old Hunstanton standing out against the bright blue sky. This was going to be a good day to walk the first stretch of the Norfolk Coast Path! 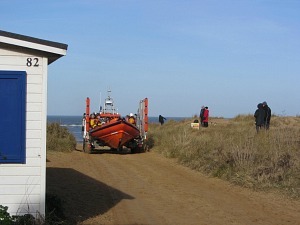 Arriving at Old Hunstanton beach, I walked just above the beach huts (no kite surfers out today, maybe the wind wasn’t strong enough). I was in for a treat, however, when I arrived at the RNLI lifeboat station, as I timed it just as they were coming in from a practice session. The boat, which was on the back of the trailer, was gleaming in the sunshine, as was the tractor pulling it along. So many distractions for me today, it was wonderful. I continued on along the easy walking sand and grass adjacent to the golf course, golfers out in force today! 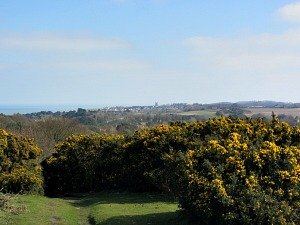 I then took the path on the top of the dunes so I had the fantastic views of both the beach and the golf course. 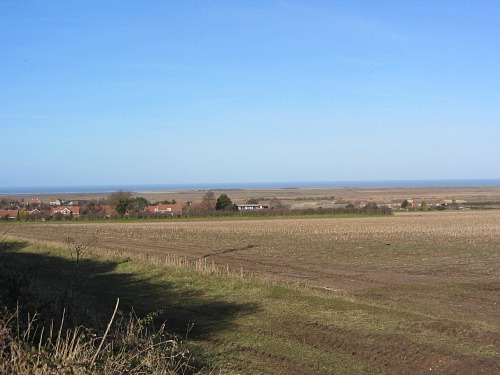 On I walked towards Holme-next-the-sea, knowing that soon my binoculars would come in handy. I was looking forward to the wildlife that I knew I'd see. 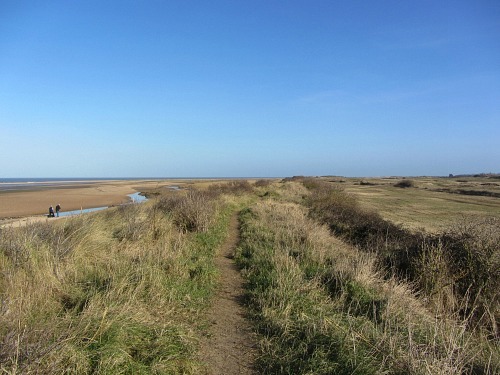 I wasn’t to be disappointed as I walked along the path through Holme Dunes Nature Reserve. Egrets and Redshank were performing, as were curlews and a fantastic display of Brent Geese, deciding they would fly over in formation out to sea. The sight and sound was just wonderful. Inspired by my sightings, I continued through the pine forest and along the banks towards Thornham (being distracted by yet more Norfolk Terriers!). 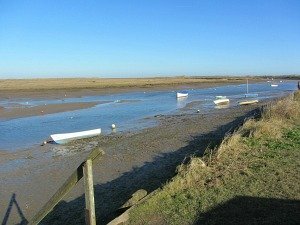 Beautiful views of salt marshes and water meadows for miles. Reaching the creek at Thornham, I was again side-tracked by a Norwich Terrier this time(my sort! ), I can’t help but stop and talk to the owners when I see someone after my own heart! I arrived into Thornham for a well-deserved lunch at the Thornham Deli – delicious and well worth the stop. A huge smoked salmon and cream cheese with chive sandwich, crisps and salad, plus a coffee and a leg rest. The morning had been just such a wonderful experience, made all the more fantastic by the weather. 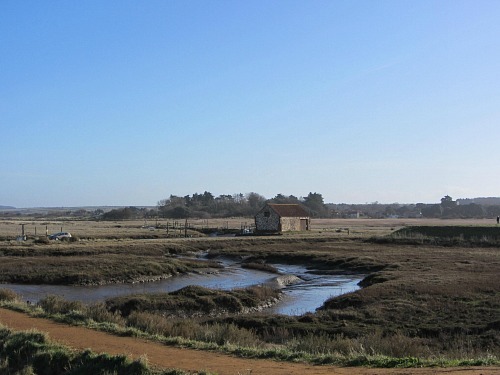 But even if the weather isn’t as nice, the views across the beaches and salt marshes are second to none in my opinion. This is coastal scenery at its best. 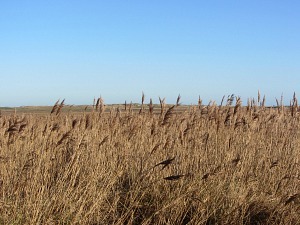 To continue with the Norfolk Coast Path blog - this second part was not quite as awe inspiring as the morning had been. 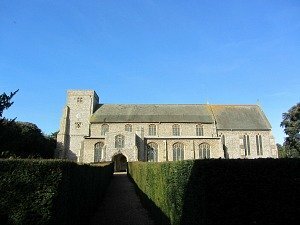 However, as you walk out of Thornham, take a look on your left at the beautiful Thornham church. 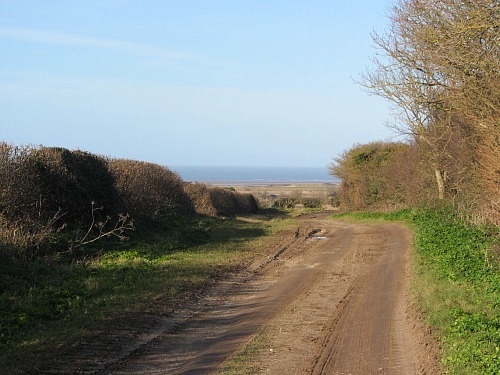 This next stretch wasn’t the most exciting as it entailed walking up hill on a small tarmacked lane, but turning round to look at the view over Thornham to the sea was worth the climb up the slight incline. 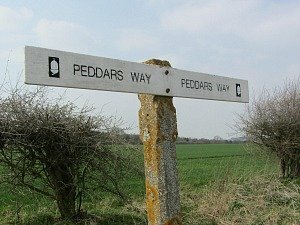 Eventually I reached a waymarker to take me up along open countryside (I had wondered whether I had missed the turning at one point and was glad for my OS map). Although not a coastal view, it was still pretty spectacular, with open fields, intensively farmed, but good old countryside at its best. I reached a barn where there were a few birders hanging around. I wondered what they were looking for – “corn buntings” they informed me. 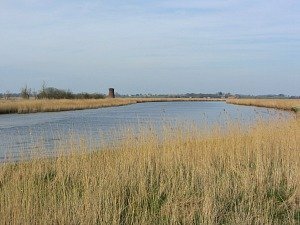 This is the only other place in Norfolk where you can see them, the other being the Fens. 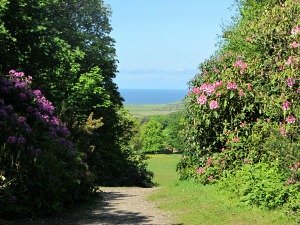 I have to say I don’t think I saw any as I meandered on along the grassy and muddy track to eventually turn a corner and face the sea again - that was a welcoming sight! 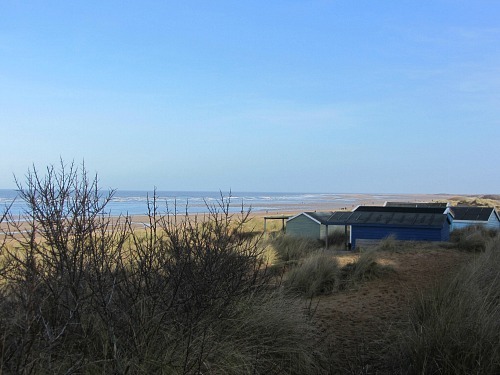 In the distance I could see Brancaster Golf Course, set apart from the village and closer to the sea. I wandered on down the muddy track to finally arrive into the village with the church straight ahead of me. 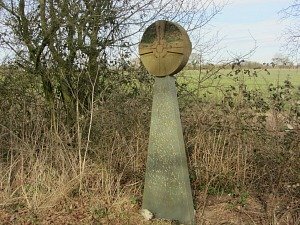 I crossed the road, on past the church and turned a sharp right at the reed beds. 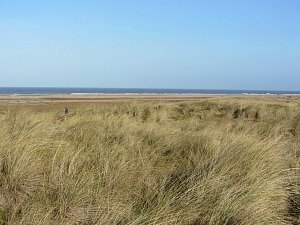 This next stretch was a one and a half mile walk along board walks all the way to Brancaster Staithe Quay with views over to Brancaster golf course and the sand dunes. 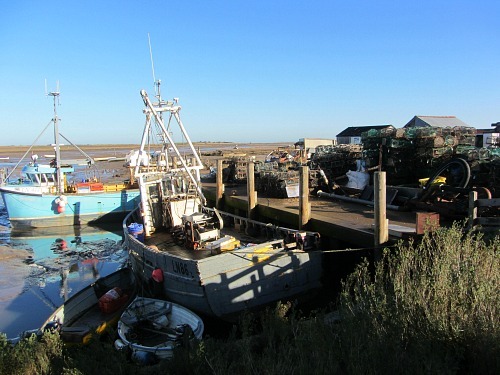 Brancaster Staith Quay is very obviously a working fishing quay full of lobster pots, fishing nets and fishing boats. Along here I stopped very briefly at the Roman Fort of Brandodunum which happened to be right on the path. A grass field as far as I could see. There was an information board, but with all other incredible ruins we have in Norfolk, this one didn’t really do it for me. I had made Day 1. 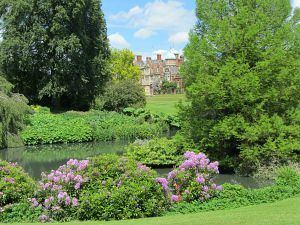 It was a most enjoyable and beautiful walk today. I hope tomorrow brings the same.